What exactly does this word mean? 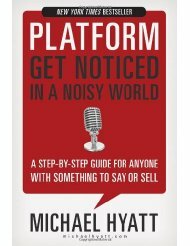 I was recently at a workshop and the book, “Platform: Get Noticed in a Noisy World” was highly recommended. It is a book filled with thought-provoking exercises … and most importantly, it gives helpful suggestions to successfully market products and services in today’s marketplace. The author, Michael Hyatt, spells out step-by-step how to build a “tribe” and connect on social media. Not in a million years did I think I’d be doing this, but in the past five months, I’ve actually enjoyed my social media interactions. If you are reading this blog, you are likely part of my tribe – come on over to Facebook, LinkedIn, Twitter and YouTube to friend, connect, follow and subscribe. What fun!